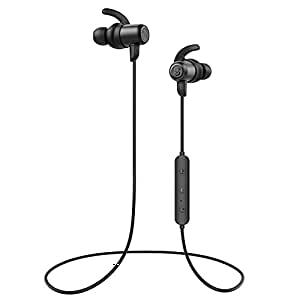 🌻[IPX6 Sweat Resistant]: SoundPEATS sweat resistant IPX6 level prevents the sports earphones from sweat or light rains and perfect for outdoor activities, such as jogging, running, camping, hiking, weight-lifting and so on. 🌻[Stereo Sound Quality]: 10MM speakers combined with bluetooth 4.1, APTX codec and CSR8645 chip create HD and lossless music. So you can enjoy the superb clear and stereo music with great bass. 🌻[Magnetic Design&Secure Fit]: The built-in magnets prevent the wires tangling together, so you can attach the earbuds together when not in use and wear it like a necklace. It is very convenient when you are doing exercises. In addition, there are 5 different size of ear tips(XS/S/M/L/XL) and 3 pairs of ear fins, offering you a comfortable fit experience. 🌻[In-line Mic&Button Control]: You can enjoy hands free phone calls, manage volume and music track easily and efficiently with the in-line microphone and button control. Attention: When you charge the earphones, please make sure that the current should be under 1A. SoundPEATS offer every single product from our shop 12 months warranty to guarantee the enjoyment of your purchase. To give you a better wearing experience, we provide 5 different sizes of ear tips(XS/S/M/L/XL) and 3 set of ear hooks, which are made from soft silicone. In addition, there are cable clamp as well as cable buckle that you can use to fix the cable on your clothes and adjust the length of cable. 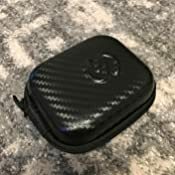 If you use the accessories and the earphones still couldn’t stay in your ears, please feel free to let us know, we will try to make things right for you and make improvement on it. Your opinion is very significant to us. 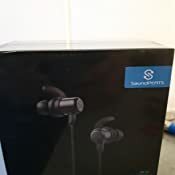 5.0 out of 5 starsFantastic Bluetooth headphones. Excellent value for money! One of the unique features of this headphones is that they are magnetic. So, when you are resting them around your neck (something people frequently do when they are done working out), you just clip the earbuds around your neck and wear the earphones like a necklace. No more slipping off your shoulders and losing them. 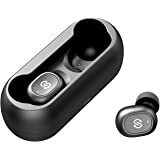 Besides the unique magnetic design, the SoundPEATS Q35 Wireless Earphones are IPX6 sweat resistant and have a battery life of right around 8 hours. The earphones take about 1-2 hours to complete a full charge, which is really good. A control panel along one side of the earphones allows you to turn the headphones on and off, control volume and skipping to the previous or next track in your music. The control also includes a built-in microphone so you can use the earphones to take calls when connected to your smartphone. As for sound quality .. it has rock pumping bass... so if you are rock lover and want great bass these are the headphones for you! 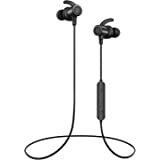 Overall, excellent value for money and I really like how light weight it is together with the magnetic design to help keeping it in place when the earbuds are not in your ears. It also comes with a handy travel case for easy transport when you need it. 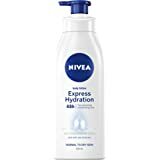 I've owned this product for less than a week now, have used it a few times and have only charged it once. But so far I'm pretty happy with it. 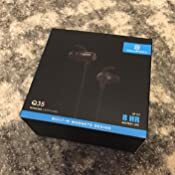 The sound quality is very good, with deep bass and very clear sound, relatively good on the lows but the mids and highs is where these earphones shine. It's comfortable now on the ears since I started using the small earbuds / hooks, at first I was using the medium-sized earhooks & buds and the right-side earphone kept falling, its a good thing that Soundpeats provided multiple earbuds / hooks (from small to large). 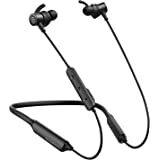 Bluetooth connectivity is good, fast pairing with my LG G6 and never once I had a difficult time to pair my device to the earphones even when there are other bluetooth devices around. Perhaps, the best feature i really like is that - it doesnt beep every time you turn the volume up or down, and it only beeps when the volume is on the highest level which is great so atleast I know that I dont need to keep pressing the volume up. Cant comment on the durability since I've owned it for less than a week. But will surely update this review if this thing breaks and don't last for atleast a year or so. Overall, I'm very happy with it. 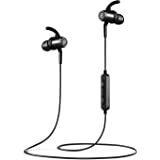 High-quality and well-priced wireless earphones for people on a budget. I would gladly buy another if I ever need another one and as long as the price doesn't change. Otherwise, I will move on to the next budget, high-quality product. 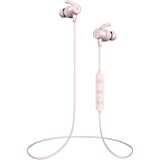 5.0 out of 5 starsComfortable wear, Great sound quality!! I'm loving it. It has been my daily driver since i get it. i take it out when i get out if home and the battery stills long lasts when i return from work and visit. its so comfortable with the soft ear buds. this one comes with so pretty storage case. The sond is so clear and noisefree with quality sound. Value for money. Fine product and trusted seller. My boyfriend bought the same pair and it is so good that I bought a second one so we have a matching headphone. The sound quality is great, as good as the apple headphones, if not better. Bluetooth pairing is quick and easy. Battery lasts for a fair amount of time, i used it to watch movies for more than 5 hours but still ok. I recharged afterward so I haven't tested its maximum duration. The only thing I hope the seller can improve is to create a way for users to find out how much battery is left. 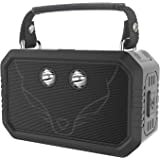 5.0 out of 5 starsA great product for the cost, with decent sound quality. This is a good headphone for activities with the ear fins to help keep them in place. I also like the magnets on the back to help keep them around the neck when needed. Also has a great many different sizes for the ears, making it a snug fit for any ears. Battery is long lasting and quick charging which is great. 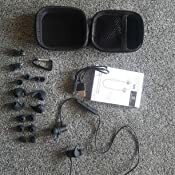 The headphones came well packaged, also a strong hard case was also included so you can travel with them easily. The sound quality could be a little better and the headphones do protrude out the ear a bit. However for this price point what more could you want. these would be great for exercise as if they get damaged you did not spend a fortune on them. This has been a reliable set of wireless earphones. Battery life is great, sound is ok, and the fit in the ears is snug. They don’t fall off while I jog. I do own a pair of beatsX earphones and other True Wireless earphones, but the Soundpeats is the one I use for jogging since it’s sweat resistant. The wire clip is pretty handy, too, as it prevents the in-line remote from bouncing around too much. After a few days of use I’ve found that the right side is quieter than the left it’s quite annoying since the left side is more prominent and sometimes dosent play background audio. I would appreciate it if I got a replacement to see if it’s got the same problem or it’s just mine. Other than that it’s quite nice the sound is decent it’s pretty comfortable too bad the left side is louder than the right.